The Coldness of the High Desert short story illustration. Charcoal drawing by author. This was M.’s second bus station since he had crossed the border, and he still didn’t know where he was going. 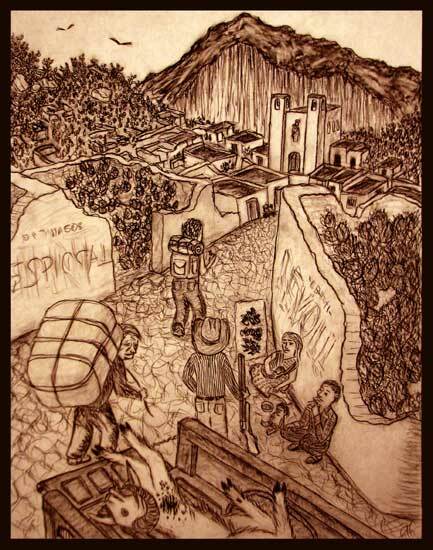 The only thing he had decided in Nuevo Laredo was that he would know by now, and he didn’t. If he stayed on express buses heading south, he could start seeing tropical plants and animals in a day or so, and it would be warmer. That had been the general idea all along. But M couldn’t stop staring at the map. It had been bothering him since Baton Rouge. What if the deserts of border country were interesting? How could there not be petrified wood and fossils and other artifacts washing out of the eroded places? He only had one long-sleeve shirt and a jacket, but how cold could December get in a place south of Texas? Then it occured to him that December might be the best time of the year to see the deserts, and that decided it for him. He would take a detour in border country. The book said La Leche de la Reina was very old, small and had great views of the desert. It said that Leche had been a silvermine in Spanish times and then a bandit fortress for over a hundred years after the mine was abandoned. It sounded like the most interesting side trip he could take from there. M. thought of the Spanish words he needed to ask if the bus to Leche ran every day and if it had already left. The words came easily in his mind, but speaking them was a different story. M. hadn’t slept well on the buses from Georgia, and what Spanish he knew was from listening to the radio, not speaking it. M. practiced saying the words in his mind until he had enough confidence to walk up to the man in the ticket window. From the start, it all went wrong. Before M. could speak, the ticket agent said hello and asked him a strange question about his pack, something about the north. M. didn’t understand what he was supposed to say in response, and in the end he had to laugh it off awkwardly. Then the ticket agent explained it was just a joke about the colder weather, but the sudden understanding only made M. feel even more foolish. By the time M. got his ticket and found out what days the bus ran, his back was wet with nervous sweat. Did he know enough Spanish to be wandering around by himself in Mexico? M. paused by the side of the ticket office to considered it, but the first thoughts of what it would really be like to go back home now convinced him to keep going. M. shouldered his pack and walked out to where the buses were parked. It was colder than it had looked from inside, and noisier too. The only thing between the station and the highway was a battered cactus hedge and a few empty cinder-block houses. Diesel trucks roared past the empty houses leaving clouds of exhaust and dust in the dry desert air. The cold wind carried the dust across the parking lot of the station and deeper into town. Everything was covered with dust, even the large modern express buses. M walked past the express buses to the last bay where an older Volkswagon microbus was parked. The driver was standing around the bus and smoking a cigarette. M. said buenas tardes and held out his ticket. The driver coughed and spit into the dust and nodded toward the side door of the microbus. The tiny van was already packed with bushel sacks of yucca and other produce, so M. sat down on the rear seat beside the only other passenger and held his pack in his lap. The passenger was an old man who wore ragged dirty clothes and lived out in the desert without running water. The old man pointed to where M could stow his bag, and then they just waited in the cold without speaking. Then the driver got in and started the engine. The driver adjusted his mirror and started backing out when two middle-aged women in black came running out of the station toward the bus. The driver killed the engine and looked back at the old man and M. It was obvious that he would need to move things around to accomodate the new passengers. The driver got out and came round and opened the side door, and M. and the old man started to get out, but the driver told them that they were good where they were. Then the driver started pulling out sacks of yucca and tying them to the roof of the microbus. He had the first seat cleared within minutes, and then the two women in black got in, and they were off. The women in black held rosaries and talked quietly to each other. From what M. overheard, he gathered that they were on a pilgrimage to the shine of the virgin at Leche or were maybe coming to visit a dying relative, maybe both. The ride to Leche was only a few hours, but they spent most of it on a single dirt road heading west across the empty desert. There was nothing to see except for blowing trash and a few dirty villages clustered around wells. Even the scrub was sparse until they started climbing into the foothills. In the foothills, they crossed a series of dry creekbeds until they came to an intersection with another dirt road. At the intersection there was a tiny cluster of cement-block houses. They were all abandoned, even the one that served as the combination lunch counter and convenience store. The cement picknick table out front had been knocked flat and broken, and the stunted trees on either side burnt black as charcoal. M. could tell from the age of the junk that the people hadn’t left that many years ago. Mud washing down the gullies had started to bury some of the trash, but shattered pieces of glass sparkled on the red dirt and drew the eye in. M. could still see charred boards and melted plastic and broken audio cassette tapes beneath the desert scrub. M. closed his eyes and tried not to think about all the junky houses there must be scattered around, abandoned, with all their trash blowing across the desert. He felt like he might be coming down with a fever. If only he could get some place and sit down and drink some water. He tried to sleep, but the road was too rough. The driver did his best to steer around potholes and washouts, but the van was overloaded and road low on its springs. They banged and bounced around each turn until they came to the base of the mountain. From there, the road began to climb more steeply, and then there was a series of switchbacks in low gear that lasted until they reached Leche at the top of the peak. The road simply ended at the last switchback and became a narrow alleyway that ran uphill between adjacent cement and stonework dwellings. This was the main street of Leche, and this is where the microbus stopped and let M. and the other passengers out. The best selection of multicolored glass mosaic tile for murals, fine art, and craft is at MosaicArtSupply.com. They also have mirror tile, gold glass, smalti, gemstones, beads, marble, glazed ceramic, and mosaic tools. Free patterns and lots of online instructions.